Cloud Computing in Business is to develop a cloud strategy, you have to get a view that it is a valuable to invest in cloud computing today is to move forward. Otherwise the phrase, Cloud Computing in Business will remain to you as a meaningless phrase. 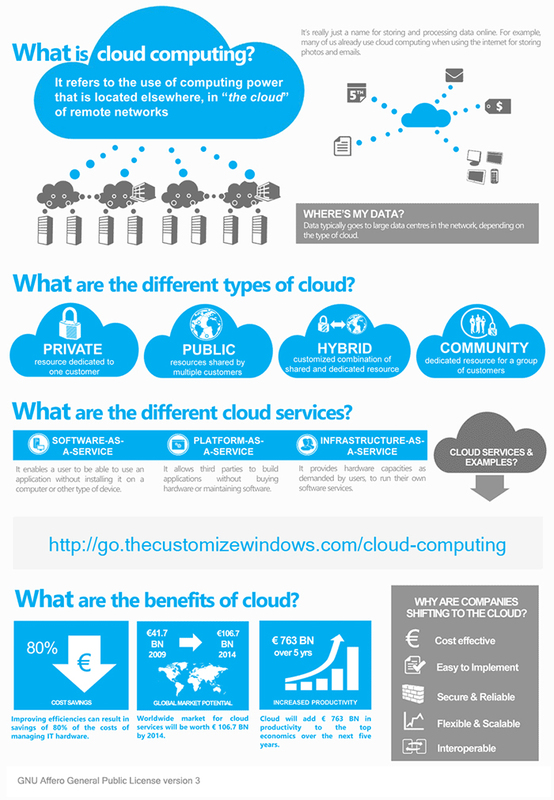 Cloud Computing is more about business than a technology itself. The steady growth in cloud computing services reflects the speed with which companies are moving; partly or completely – for their storage needs, applications and computing needs. Gartner in 2011 estimated a strong market growth with profits from cloud services that will reach 148.8 billion dollars globally. That only has crossed, it has practically grown like the math of spreading a rumor. This wave of enthusiasm for cloud computing is not unfounded since the benefits are extremely interesting to the users. The opportunity to drastically reduce the costs, as well as to support the operational efficiency, business collaboration and business agility are the main drivers. In addition, the emerging services offer many options and choices, including the IaaS, such as that offered by Amazon Web Services, Rackspace and others; Platform as a Service (PaaS), such as offered by Heroku Cloud, App Fog and Google Apps; Software as a Service (SaaS), such as that offered by Salesforce.com. The early adopters of cloud computing technologies consider migration as a business imperative, despite the potential threat of interruption of the services and exposure to the risks to privacy and security. It is clear, however, that the cloud computing service providers understand well that the initial hesitation can be alleviated concerns by establishing stringent Service Level Agreement (SLA) directing uptime, security and privacy. There are also a number of issues as important as they begin to emerge in conversations about the risks related to the cloud. Today more than ever, the careful evaluation and the creation of partnerships with other organizational leaders are essential to understand and mitigate the risks related to management, problems at the regulatory level and exit strategies. Until now, companies have focused on the integrity and availability of data, but have not spent much time considering requests for retention and disposal of information. This area needs the collaboration between IT and corporate legal departments to understand and articulate the specific needs of the disposal and storage of data, especially since the contracts of many vendors of cloud services are copy of standardized agreements. In addition, one should keep in mind that the cloud providers fall into the business of collecting data. The argument to delete the data does not appear often. The move to the cloud computing platform assumes easier data management but management of storage data in this new frontier zone may be more complicated and difficult. For this reason, companies and Individuals need to find out what options are best for them. This Article Has Been Shared 5487 Times! Cite this article as: Abhishek Ghosh, "Cloud Computing in Business : Risks and Liabilities for the Transition," in The Customize Windows, February 5, 2013, April 23, 2019, https://thecustomizewindows.com/2013/02/cloud-computing-in-business-risks-and-liabilities-for-the-transition/.